1st September 2018, Manila - “EA Mid-Autumn Celebration 2018” held from 1 September to 7 October, 2018 (GMT+8). This is the second year of EA to take place a Million Lucky draw promotion for celebrating the Mid-Autumn Festival. During the promotion, players achieve the mission who will get ONE lucky draw opportunity. 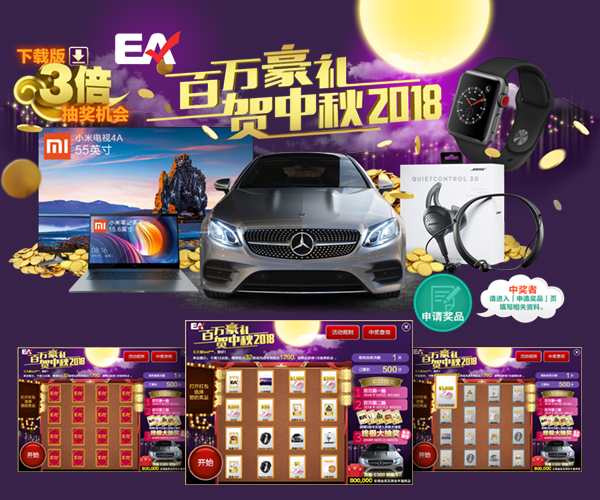 As usual, EA prepared fabulous prizes, including Benz E300 sports car, XIAOMI notebook, Television, BOSE headset, Apple watch and over 1,000,000 cash prize. Let’s come to join us!